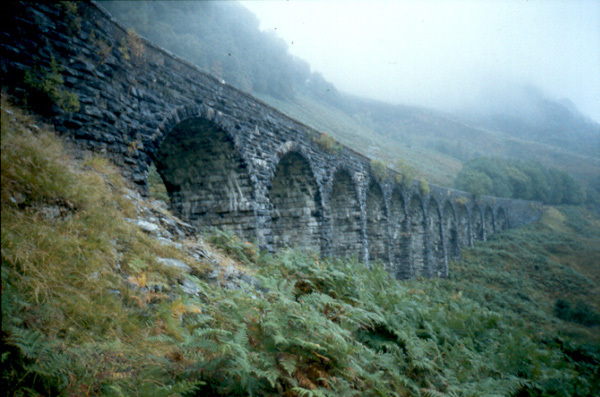 The route of this walk includes a spectacular section of the former Callander & Oban railway line which closed to Crianlarich in 1965 due to a rockfall in Glen Ogle. Now the trackbed has been transformed into an enjoyable walk suitable for all the family with the return journey by way of a good path that winds its way down the floor of the glen. From the information board at the start, cross the A85 and head up the track towards the Scout Station. This is the former Lochearnhead station building which has been restored and converted into an outdoor activity centre for Scouts. Although marked private, the Scouts do welcome visitors, so if you want to see the old station there should be no problem. The trail doesn't actually pass by the building and a few yards from the main road you will come upon a path which branches right and a sign marks the way. Follow the path up the hillside to the railway line perched about 100 yards up from the start. The climb through the bracken is steep and can be a little muddy in places. However as height is gained views down over Loch Earn reward the effort. 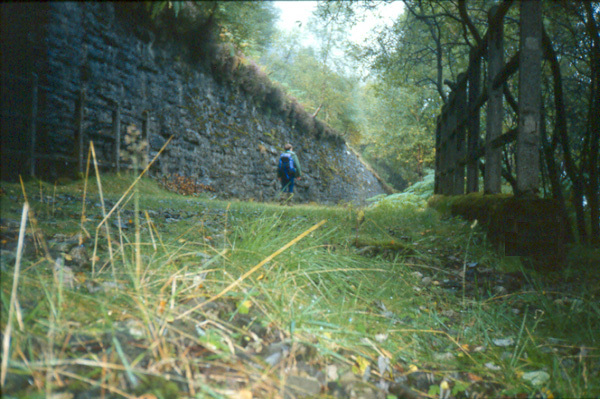 A yellow arrow on a post marks the start of the trackbed section of the walk. It climbs steadily with a nice even gradient up through the trees that now surround the line. The trackbed underfoot has recently been upgraded to ensure it is suitable for cyclists as this is now part of a long distance cycle network. 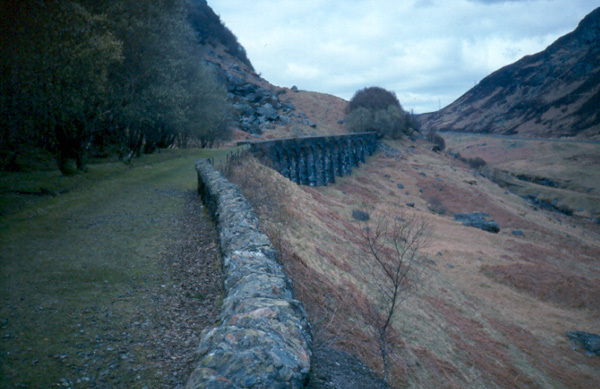 Two miles on you cross the spectacular Glen Ogle viaduct which offers a good viewpoint. Continue up the trackbed until a stile on your right marks the high point and the start of the path down. Cross the stile and follow an obvious path down the glen. This gradually descends to meet the burn in the valley floor then rises up to cross the A85. A stile takes you over the fence. Be careful crossing the road as traffic is fast, especially downhill, and visibility is not good in either direction. Once over, the path takes you over a tussocky stretch of ground and after two stiles and a river crossing you pass over grassy sheep grazing land. Here the path becomes a little less distinct in places but there are frequent waymarkers to keep you on course. distance, you are back at the start. 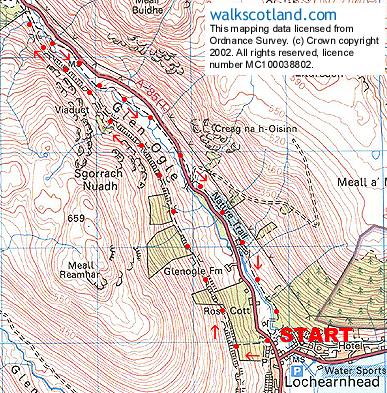 Start A85 on northern edge of Lochearnhead where there's a walk information board (grid ref NN 587240). Parking Car park in centre of Lochearnhead. Grading Easy walk on low level path and well made up former railway trackbed.